When the TH&B was originally constructed in the 1890’s, its Hamilton-Welland mainline ran at grade through central Hamilton down the middle of Hunter Street. This soon proved to be troublesome, as complaints about noise and soot quickly mounted. With the advent of the automobile, and the TH&B’s trains blocking traffic, pressure mounted for a separation of road and rail. In the 1910’s, the city of Hamilton attempted to convince the federal government’s Board of Railway Commissioners (the BRC) to have the TH&B tracks along Hunter Street abandoned, and to have the Grand Trunk allow the TH&B to run on their tracks along the waterfront. This was later squashed in the courts, but the message was clear. The TH&B began studying means of separating the tracks from the streets. 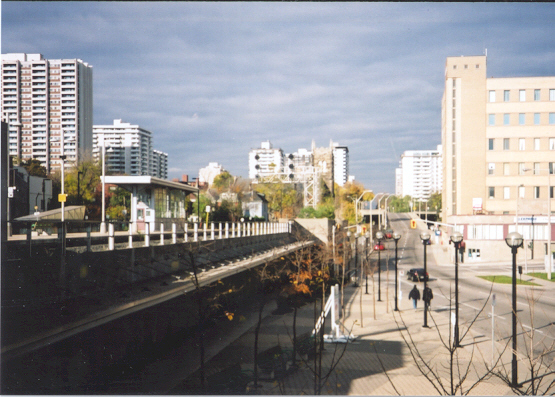 As World War I progressed, the TH&B acquired property on the south side of Hunter Street, for both the construction of elevated tracks and a new station, as the old Hamilton station was becoming overcrowded. As the 1920’s wore on, arguments between the city of Hamilton and the TH&B dragged on, until an agreement on the closing of several streets and the construction of elevated trackwork was signed on Oct 20, 1930. Construction began the following April on the grade separation. The new Hunter street station was built adjacent to the original TH&B Hamilton station. The original design for the new Hunter Street station consisted of a 10-story office tower with wings for the passenger facilities, and two platforms for passenger trains. However, as the Great Depression took its toll on the TH&B, the plans were reduced in size. The office tower was reduced to 7 stories (although it was built with the ability for the remaining three stories to be added at a later date), and the number of platforms was reduced to one. As well, a number of other features such as underground passageways were eliminated. The reduced size of the station resulted in an outcry from the city council, and it was only after the facade of the building was changed to more expensive stone, that the council approved the smaller structure in November 1932. Construction of the new station began in December 1932, and took 8 months to finish, with the official opening on June 26, 1933. As the Great Depression slowly improved, so did the station’s fortunes. By the start of WWII, Hunter street station saw nearly 30 trains a day. During the war years, the TH&B saw passenger levels double as gas and rubber rationing force people onto the rails. Special trains carried troops (such as my grandfather) to training camps at Niagara-on-the-Lake, and airmen to the airbase at Dunnville. But when the war ended, so did the good times. As cars and planes rose in popularity, the passenger traffic plummeted. By 1960 all the branch line trains were gone, as had most of the traffic to the US. By the start of the 1970s, the only passenger traffic that Hunter Street saw was a daily Toronto-Buffalo train consisting of CP Rail RDCs. The TH&B underwent major corporate changes in the 1970s, with the bankruptcy of majority shareholder Penn Central in 1972, and the subsequent creation of Conrail. As part of Conrail’s formation, all foreign properties were to be eliminated. Minority shareholder CP Rail bought all of the TH&B’s shares, and became the sole owner of the TH&B in 1977. Soon after began the transfer of TH&B’s operations to Toronto. 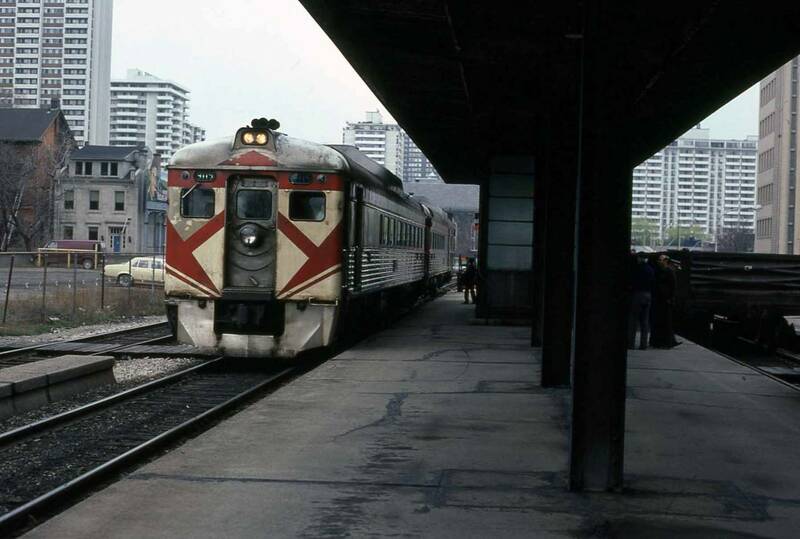 At the same time, the formation of Via Rail resulted in the removal of all passenger service off of the TH&B, with the last train leaving on April 23, 1981. With the official absorption of the TH&B into CP Rail in 1987, all remaining corporate and railroad operations began were transferred to Toronto. This process was completed as of December 8, 1990 with the shutting down of the TH&B’s Centralized Traffic Control centre. Within weeks, the station lay vacant. CP Rail gained a measure of infamy in the early 1980s, when it demolished its West Toronto station in the face of widespread opposition. As a result of this, new government legislation was enacted to protect historically and architecturally significant stations such as the Hunter Street station. 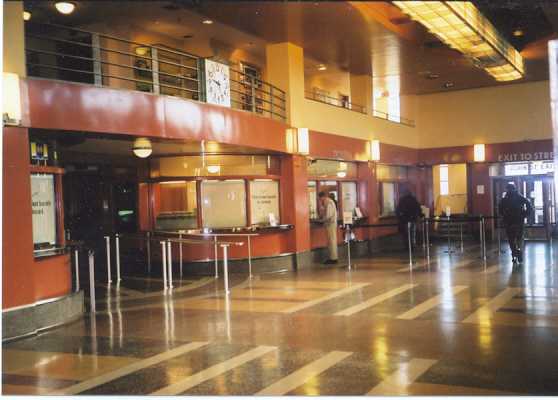 This prevented the demolition of the Hunter Street station as it sat empty. 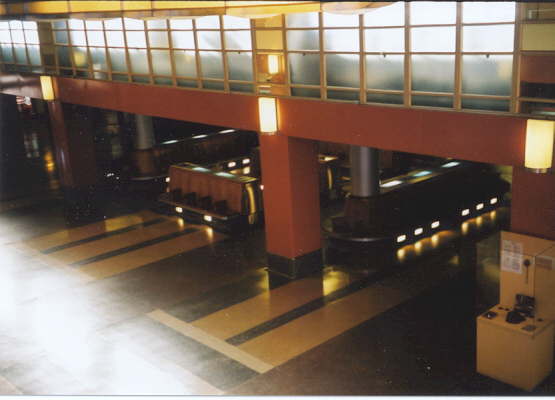 As early as 1982, an alternate use for the Hunter street station was explored. As part of the GO-Advanced Light Rail Transit (GO-ALRT) system proposal to build high-speed electric trains in the Greater Toronto Area, the option of using the Hunter street station as the main Hamilton station was examined. While both the option and the GO-ALRT proposal were not acted on, the idea of using the TH&B station for GO Transit purposes was planted. 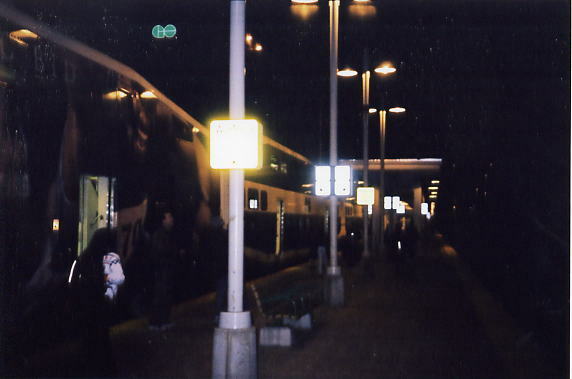 At this time, GO Transit was using the old CN James St Station as its Hamilton terminal. However, rising maintenance costs due to the age of the structure, and the abandonment of the station by Via Rail and Amtrak for the nearby Aldershot station, made GO Transit decide to look for an alternative. 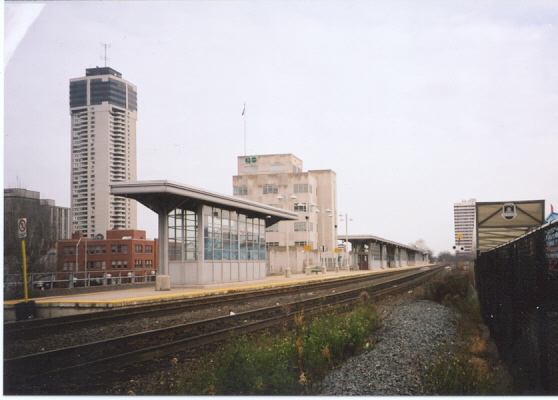 Debate dragged on in the provincial legislature, until on April 23, 1992, it was decided to transfer operations to the Hunter street station as part of a $56 million Hamilton area GO Transit improvement package, which would include the redesign of nearby trackwork and signals. $16 million would be spent on restoration and renovation of the station itself. 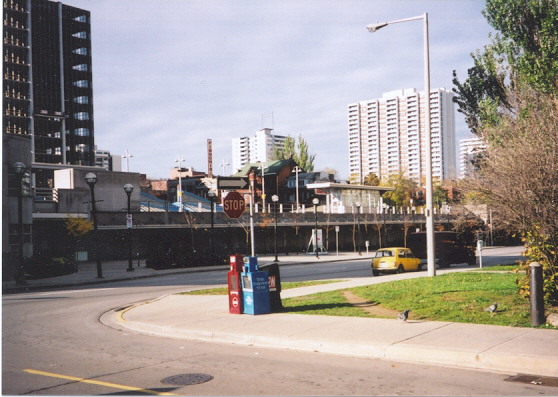 This included the construction of a new intercity bus terminal at the back of the station, on the site of the old freight express building, replacing the Rebecca St Bus Terminal. 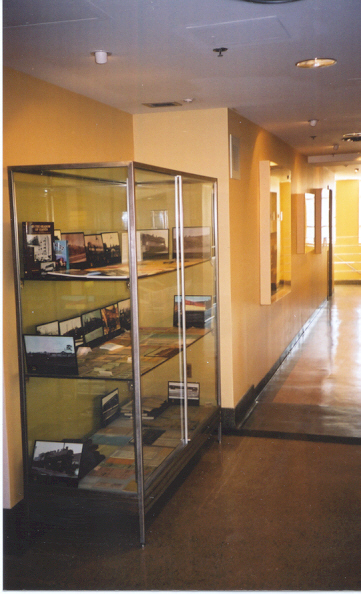 Work on the station began in December 1993. The poor condition that CP Rail had left the station in after years of neglect, on top of its age, resulted in increased costs and delays. However, the restoration work was finally completed in 1996. 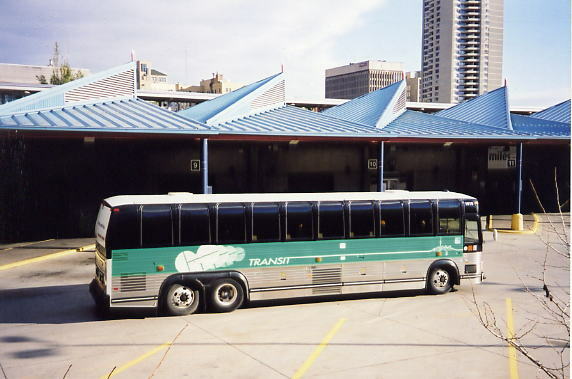 GO Train and bus service started on April 29, 1996, and the official reopening of the TH&B Hunter Street station, now renamed the Hamilton GO Centre, occurred on July 12. As of 2009 four GO bus routes radiate out from the Hamilton GO Centre; the Hamilton QEW Express bus to Toronto, the Hwy 407 West bus to York University, the Hamilton-Meadowvale Business Pk GO Bus, and the buses connecting to all-day GO trains at either Aldershot or Burlington. 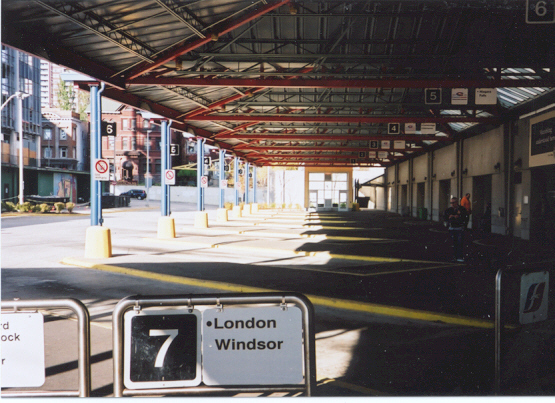 The Hamilton GO Centre is also home to private intercity bus lines, such as Greyhound. Currently, four trains depart the station each weekday morning bound for Toronto, and four trains make the reverse trip each evening. The recent construction of an additional track west of Burlington allows for all day GO train service to Alderhsot and beyond, but the bottleneck formed by the Hunter Street Tunnel just west of the Hamilton GO Centre means that all day trains will not be extended to Hunter St. Instead, plans are underway to use the Hamilton GO Centre for rush hour trains and all GO buses, while all other GO Trains will use a new platform to be built at James Street north, in the shadow of the former CN James St Station. 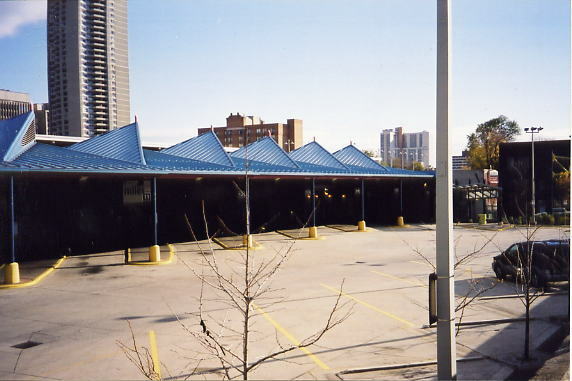 The east bus bays. The first few are used by GO Transit for its buses. The rest of the bays are currently empty. It's May 4, 1933 and with almost two months until its official opening, the new TH&B Hamilton station has received its first foreign visitor. London, Midland & Scottish Railway locomotive 6100 Royal Scot was making a North American tour as part of it's trip overseas for the 1933 "Century of Progress" Exhibition in Chicago. Royal Scot has been preserved, and still runs in the UK. Copyright © 2001-2012 Tom Luton. All Rights Reserved. | hamiltontransithistory@rogers.com | Last updated November 1, 2012.